1Choose the green ball icon from the icon menu (see this figure). 2In the Name field, type a name for the Object. 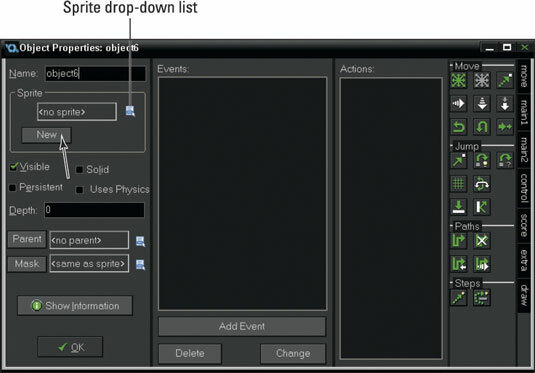 3To assign a Sprite, click the drop-down icon from the Sprite section. 4Click the New button from the Sprite section to open the Sprite Properties window. 5Select the Visible check box if you want the Object to be visible in the game. 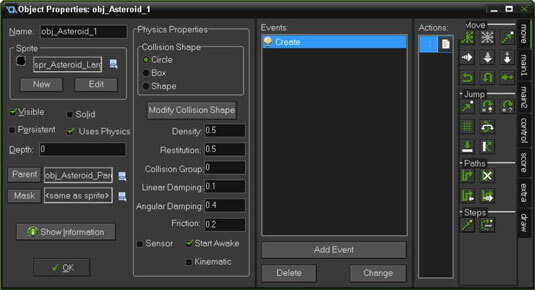 6Select the Solid check box so that GameMaker knows this is an Object that will likely collide with other Objects. 7Select the Persistent check box for the Object to carry over from Room to Room. 8Select the Uses Physics check box to create a physics world. 9In the Depth field, enter a numerical value (such as 10,000) to determine which layer of the Room you want the Object to reside at. 10To assign a parent to the Object, click the drop-down icon (see this figure), and select an Object. 11To assign a Mask to the Object, click the drop-down icon and select the Sprite with the Mask you want to use. 12Click the Add Event button to select an Event to add to the Events section. 13Drag and drop Actions from the tab on the right to the Actions section. If you forgot to load a Sprite before you started making your Object, you can click New from the Sprite section of the Object Properties window to open the Sprite Properties window. Then you can proceed to load a Sprite or create a new one through the Editor.